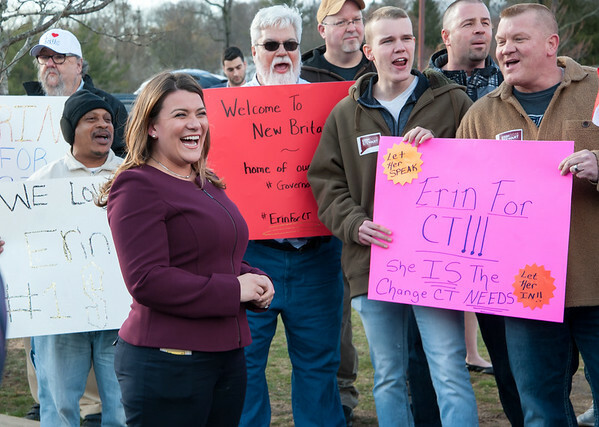 NEW BRITAIN - The Connecticut Republican convention didn’t go as Mayor Erin Stewart had hoped. On May 11, she dropped out of the gubernatorial race and announced her interest in the GOP’s endorsement for lieutenant governor. On May 12, she was defeated for that endorsement by state Sen. Joe Markley of Southington. While she didn’t win the lieutenant governor endorsement, Stewart got more than 26 percent of delegate votes, easily exceeding the 15 percent needed to qualify for the party’s primary on Aug. 14. She is now getting ready for a primary campaign. “Since the convention, we’ve kind of regrouped,” Stewart told The Herald, adding she has reassembled her campaign team. Stewart said that, even as she was running for governor, her goal was to qualify for the primary, not necessarily win the party’s endorsement. Even that wasn’t a guarantee, though. There are sharp differences between Stewart and Markley. Markley is considered by many as one of the more conservative members of the state’s legislature. He ran as a Tea Party-backed candidate in 2010 and won. Stewart has also touted herself as fiscally conservative but, on many issues, socially liberal. The party’s endorsed gubernatorial candidate, Danbury Mayor Mark Boughton, is, like Markley, conservative across the board. Stewart, 32, said she’d better help her party attract Democratic voters, especially in urban areas. She said gender and generational balance are important to a successful gubernatorial ticket. The mayor acknowledged she’s received pushback for her comment to reporters that “two white men” isn’t what residents are looking for in 2018. Stewart said she was, essentially, stating the obvious and was surprised at some of the criticism. “I stand firm in my belief that we need to show the state that the Republican Party does have diversity and is willing to have different and broader ideas and ideologies on the ticket than before. We need that,” Stewart said. Stewart said she believes her candidacy would help the Republicans’ gubernatorial chances in November. Now, Stewart is focused on fundraising and continuing to spread her messages across the state. “We’ve pretty much spent everything that we’ve raised for the governor’s campaign, but because we made the decision to switch to lieutenant governor, you start over with your qualifying contributions for the Citizens’ Elections fund,” Stewart said. Stewart is back to collecting donations of $100 or less from state residents. To qualify for the Citizens’ Elections Program, a candidate for lieutenant governor must raise $75,000. “We did over $150,000 in what, two months for the gubernatorial campaign, so I’m confident we can get there fairly quickly,” Stewart said. Stewart won’t be the only challenger Markley will face in August. Darien First Selectman Jayme Stevenson also qualified for the primary by winning 19.86 percent of delegate votes at the convention. Posted in New Britain Herald, New Britain on Monday, 28 May 2018 21:31. Updated: Monday, 28 May 2018 21:33.